A pretty decent film with interesting characters and some fine humor that creeps up every now and again. This is a fun, light hearted criminal movie. It’s a comedy more than anything else, and the laughs all come naturally. That really is due to the actors and characters who are mostly after their own interests. There is a kidnapping for ransom here, but that’s just the start of it. We also get a husband who has no interest in paying and a neighbor who ends up in the wrong place at the wrong time. This movie could have easily been a mess, and yet somehow here it actually works. Life Of Crime is a movie that barely got any advertisement, and fell by the wayside without most people ever hearing of it at all. That’s unfortunate, considering the prominent cast, witty tone, and overall fun energy of this picture. Sure there are no Clooney’s, Pitt’s, or Damon’s in this one, but Jennifer Aniston alone should still carry some weight to her name, and here she is surrounded by character actors who are all pretty great at their craft. From Mos Def to John Hawkes to Isla Fischer, the only one missing from this roster of indie cred misfits is Paul Giamatti. What we have here is a caper movie from the mind of the great author Elmore Leonard. This is the guy who wrote Jackie Brown, Out of Sight, and Killshot. With Life of Crime, his two most famous characters get a sort of prequel treatment. The characters are Ordell and Luis. They were played in Jackie Brown by Samuel L. Jackson and Robert Deniro. 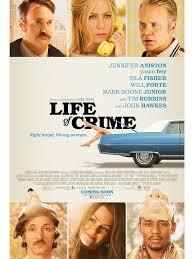 Life of Crime is not necessarily linked to that movie, aside from featuring another version of the characters. Still, it has enough connections to the group, including the introduction of Melanie (played by Isla Fischer here and by Bridget Fonda in Brown) to make it worthwhile, based on those grounds alone. The movie is about our two criminals Ordell and Luis, who plan and enact a kidnapping. When we first meet them, Luis is at a bar using the Men’s room. A larger man walks up next to him. When Luis leaves the bar, we find out that this man has just robbed him. Now we get to see Ordell help Luis enact his revenge, running the guy over with a van. Aside from this character introduction, we also get one with Mickey (Aniston) and her husband, Frank, (Tim Robbins,) at a country club dinner. Frank gets drunk and insists on driving home. This leads to him crashing his car into his driveway and the establishing that the relationship between Mickey and Frank is not very solid. Our two kidnappers start watching Mickey at the country club, and masterminding their plan about how to kidnap her. They have some detailed knowledge about her husband, Frank, and some secret accounts he has. Frank has been scamming money from real estate developments that he owns. Meanwhile, there is a neighbor, named Marshall, (Will Forte), who has a thing for Mickey and plans to take advantage of this upcoming weekend where both her husband and son will be out of town. We get a few scenes of him approaching Mickey at the country club, which help establish this dynamic. Marshall makes his way upstairs with two martinis in his hands, and as soon as he opens the door to the bedroom, Ordell strikes him over the head and knocks him out. The kidnappers lock Marshsll up inside of a closet, and then take Mickey with them, leaving the house. Ordell and Luis bring her to the house of a man named Richard (Mark Boone Junior,) who is a bigot and Nazi memorabilia collector. Richard is the third member of their team and by far the most unstable of the bunch. Richard has rigged his house with holes in the walls and doors so that he can watch Mickey without her knowing it. He’s a pervert and a peeping tom, and the movie makes it clear that while he may believe in the values of Nazis, the other members of the kidnapping team do not. There’s a great moment where Luis questions Ordell about using Richard, and Ordell responds by explaining that the man might hate block people, but he doesn’t hate Ordell. He then goes on to claim that to a certain extent with some of the ways he feels about people, Richard might actually have a point. There’s an interesting dynamic around the three members of the team. Richard is the bad guy, being the most crazy and violent. Luis is the good guy who actually starts to care for Mickey. And then there’s Ordell, the leader of the pack, who is somewhere in between. Ordell is the guy who is friends with everyone. He’s also the one who seems to have the most flexible set of values, going with whichever side will lead him to more money. The guys call up Frank, down in Florida, to let him know they have his wife and want one million in ransom. Frank is staying with his mistress Melanie, and the phone call takes him by surprise. Especially since he has just filed for a divorce the day before leaving town. Frank is confused and doesn’t know what to do. Melanie wants him to call the kidnapper’s bluff and not pay. When they call two more times, Melanie takes the phone calls herself, telling them they Frank has skipped town. All of this prompts Ordell to go down to Florida himself. While he’s doing that some problems arise between Mickey and Richard, starting with her noticing the holes in the walls and doing something about it. Luis gets in the middle and at a certain point things turn pretty violent. All of this makes for a nice, unpredictable turn of events. This is an enjoyable film with actors who handle their roles just right and a tone that supplies the right amount of humor to mix in with its caper gone wrong plot.